I was reading through Twitter a few weeks ago when one of my favorite baseball wives posted something like this: “making risotto tonight. Who the f*%# knew this took so long. #husbandorderingpizza #kids screaming”. I burst out laughing by myself when I read this. When I think of risotto, I think of a chef with a big tall white hat on, stirring the pot to symphony music. I DON’T think super quick weeknight meal! Note to readers everywhere: risotto is a gift you give your dinner companions! It takes a whole lot of stirring and even more patience, but the results are soooo worth it. I knew after seeing her post that I wanted to make it for my Easter dinner menu; it is the perfect, creamy and delicious side dish for Crusted Rack of Lamb. I wanted to emphasize the flavors of spring with this risotto, and chose some of my favorite seasonal vegetables to star in the lead role. 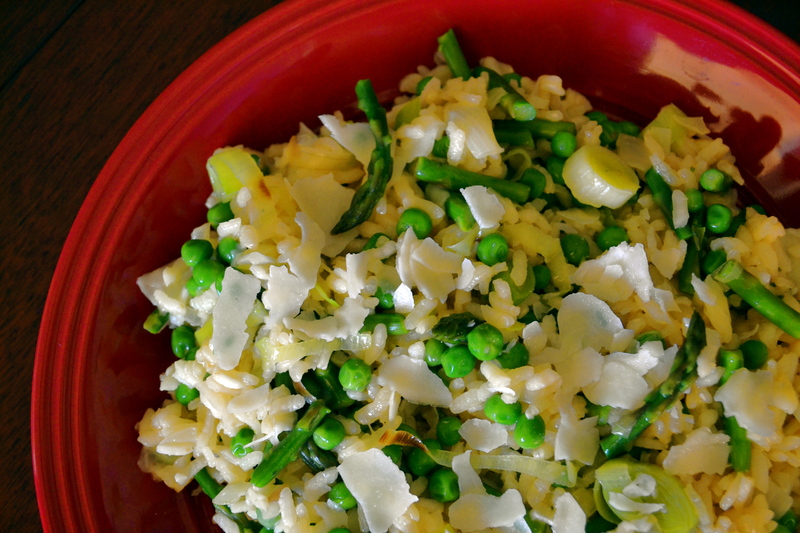 Fresh peas, leeks, and asparagus give the rice a vibrant green color and some crunchy textures. I’ve added a hint of Parmesan cheese for some salt and creaminess, but otherwise this dish is very healthy. Many restaurant risottos get that creamy texture from heavy cream; I don’t think it’s necessary. The consistency you get from cooking the rice in a risotto method gives you that velvety texture naturally. I hope you enjoy this recipe as much as we did, you’ll get a standing ovation from your guests this holiday weekend :). To make a vegetable risotto, you will cook the rice in one pot and the vegetables in a second saute pan, and then combine them at the end. Have both pans (a medium/large soup pot and a large saute pan) on the stove. Heat the large sauce pot over medium high heat. Add a dab of butter to the pan along with the onion, shallot, garlic and thyme. Saute for 2 minutes or so. Add the rice to the pan and cook another 4-5 minutes, or until the rice begins to caramelize and smelly nutty. Add the wine to the pan and stir with a wooden spoon until it is absorbed. Begin adding the chicken stock, 3/4 cup at a time, and stirring with a wooden spoon until it is completely absorbed before adding another 3/4 cup. It will start to look very velvety and expand quite tremendously. If you have an assistant in the kitchen, have them stir the risotto while you do the next part :). If you don’t, this is where you’ll get your arm workout for the day. When you are down to about 2, 3/4 portions of stock, heat the large saute pan with another dab of butter. Add the sliced leeks to the pan and saute for 3-4 minutes, or until they start to caramelize. Add the asparagus for another 2 minutes. Remove from the heat and add the peas. Stir and set aside until the risotto is finished. When you add the final 3/4 cup of chicken stock, add the 1/3 cup Parmesan cheese as well. Stir until absorbed and then add the vegetables. Stir to combine everything and season with salt and pepper to taste. Serve in a large bowl with the remaining 2 tbs Parmesan over top. Love this recipe. You make risotto like they do in Italy without all the heavy cream and butter. The starch in the rice add plenty of creaminess. I will will make this on Easter Sunday !